Someone once told me that to keep the reader’s attention when “blogging” to start off with a story or a joke. So I’ll give you a quick story before I begin my ramblings about best nasal pillow CPAP masks and the way they have changed sleep apnea sufferer’s compliance. Please note this story has nothing to do with the subject. It’s hard to say what can trigger the mind to wake up but I do know this, if you say the right phrase such as “Fire” or “You’re Late for Work”, it will get someone out of bed at break-neck speed. One night in the sleep lab I had a patient that may have had the worst case of obstructive sleep apnea I had ever seen. We use audio/visual monitoring as well as the polysomnography equipment and I had the microphone turned on in his room. During the course of the night he would have episodes of talking in his sleep, which at first I thought he may have woken and needed assistance. Upon listening, I could make out the sentence “Are there going to be any dinosaurs on this dinosaur show?”. This phrase struck me as an odd thing to say, but hey, we all have weird dreams sometimes, right? In the morning, I went in to wake the patient because he was adamant that he be up at 5:30 am on the dot to get to work on time. This man was the hardest person I have ever tried to wake up (severe sleep apnea sufferers take note). He simply would not wake up to any physical or audio commands to get out of bed. After 5 minutes, I went back into the control room to get someone to give me a hand and when we came back to the room a simple “Jerry, wake up or you’re going to be late for work” sent this 300lb man springing out of bed like he had a jet pack strapped to his back. Just goes to show you how certain trigger words or phrases can affect the subconscious. On a side note, years later I was watching a movie on basic cable and the line “Are there going to be any dinosaurs on this dinosaur show?” appeared. It brought me back to the story of this patient and finally made sense why he was saying that in his sleep. That movie was Jurassic Park. As little as eight years ago the options for comfortable CPAP mask were slim at best. You were either recommended to use a Full Face CPAP mask or a bulky Nasal CPAP mask. I’m sure all my fellow sleep technologists out there can relate to the “Darth Vader” impression patients made when you first put one of these masks on. The lack of a less invasive and comfortable mask probably contributed to the low CPAP compliance many sleep labs faced. In recent years the CPAP mask landscape has changed dramatically and has led to an influx of past CPAP users changing masks and new CPAP users becoming more compliant. Philips Respironics, ResMed, and Fisher Paykel all have versions of Nasal Pillow CPAP masks and while they are all very similar in design and functionality, modifications to their models are continually improving making CPAP use a much better experience. The ResMed Swift series of nasal pillow CPAP masks are a perfect example of this and while the Mirage Swift II, an older model, proved far superior to the Swift LT series, the Swift FX blows them all out of the water. I am still amazed when we receive negative feedback from a user and in this post I will address helpful tips for using a nasal pillow style mask. What Are Some of the New Nasal Pillow CPAP Masks on the Market? We are hearing a lot of good things about the Fisher Paykel Pilairo nasal pillow CPAP mask (currently only available overseas but expected to be in the U.S. soon). The Pilairo CPAP mask has only one headgear strap that tighten behind the ears and is expected to replace the Opus pillow mask. We haven’t heard any feedback about how well the Pilairo keeps the CPAP mask in place during the night but I’m sure the comfort of only one head strap will make this mask hugely appealing. The Swift FX series (Swift FX and Swift FX for Her) offers 2 lightweight headgear straps however ResMed has released Bella Loops, headgear straps that fasten around your ears without the need of the 2 strap headgear system. Philips Respironics most recently released nasal pillow mask is the GoLife for Men and GoLife for Women. 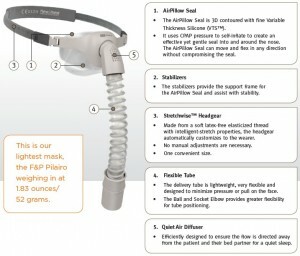 While I personally have not used this mask, I do speak to many of our CPAP customers that rave about its performance. A lot of effort and attention is being centered on CPAP masks made for women so a big question is why the sudden influx? This is easy, many more women are being diagnosed through awareness and detection and by detection I mean this. Wife notices Hubby snores and stop breathing for long periods during sleep. Wife makes hubby get sleep test. Doctor tells Hubby to sleep with CPAP machine. Hubby sleeps with CPAP machine and notices Wife is a snorer with apnea episodes. Hubby tells Wife her snoring is disturbing his sleep. Wife gets sleep study done. You get the picture. Since women tend to have smaller features, designs and sizes of CPAP masks must change to accommodate. The nasal pillow cushions are made smaller, the CPAP mask headgear harness is made smaller and the masks have different color options, pink and powder blue. Heck, ResMed even went as far as designing an Auto CPAP machine with a pink shell just for her (ResMed S9 AutoSet™ for Her). I cannot stress this tip enough. Do not over-tighten the headgear straps of the nasal pillow mask. If you do, this will create more pressure on the cushion area and you WILL wake up the next morning with a sore nose. Wear the mask loosely; trust me the cushion will not fall out. Humidity, Humidity, humidity. Nasal pillow masks are direct pressure into the nasal cavity which can cause the capillaries to swell. If you wake the next morning with a sore throat and experience dryness in the nasal passage, you can fix this with increased humidity. Replace the head straps or the pillow cushions often. Over time these parts will become stretched and weakened, causing you to over-tighten which will lead to discomfort. Make sure to use light-weight tubing like the ResMed SlimLine, a heavy tube will pull down on a light-weight mask causing irritation and CPAP Mask seal break. 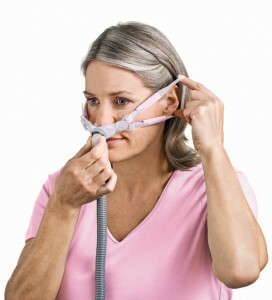 Use mask strap pads to eliminate CPAP mask irritation to the cheek area. The ResMed Swift FX series comes with this already but you can purchase Snuggle Straps to add to any mask.